As the youth development program of the Cooperative Extension System of land-grant universities, 4-H is the nation’s largest youth development organization, empowering six million young people throughout the United States. The 4-H program is delivered locally through clubs and groups. Clubs are the basic organizational unit of the program and 4-H groups support this program by meeting specific needs like project support, fund raising etc. Youth and adult leaders working together is the back bone of a strong 4-H club/group program. In order to carry the 4-H name and emblem, all 4-H clubs and groups must apply for and annually renew a 4-H charter. This ensures the safety of youth members and the quality of the educational programming. Requirements for a 4-H Club and chartered Groups are listed in the Wisconsin 4-H Youth Development Policies. It is recommended that 4-H Clubs and Groups use these Sample Bylaws to write or update their bylaws. 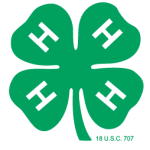 The 4-H Name and Emblem are protected under federal statute (Title 18, U.S.C. 707) This statute protects other federal emblems, like the Seal of the President of the United States. 4-H Name and Emblem Policy Guide contains a summary of the federal mandates for the use of the 4-H name and emblem by 4-H chartered entities. The Name and Emblem User Guide for Non-Extension Entities, from National 4-H Headquarters, provides a complete list of regulations around the proper use of the 4-H name & emblem. Leadership of the county 4-H Youth Development Program is provided by 4-H Youth Development staff. The 4-H Youth Development Educators and County 4-H Leader Organizations document delineates the relationship between staff and volunteer organizations. 4HOnline for Families contains resources for all families using 4HOnline. There are instructions for enrolling, registering for an event, managing your club, and taking online trainings. More updated resources coming soon!